‘With the recent influx of new members I have been asked to write an article about history of the Regiment. The unit was formed late 1969 soon after the first battle of Newbury, which was held in the September of that year and some of the original members did in fact take part in the re-enactment. The unit as it was then, was part of an existing Regiment, namely Hintons Loyall Greycoats, of which we were No.4 Companie. As No.4 Companie we went through many changes. Weapons changed, we started as halberdiers, added pistols and breast and back plates and went on the field looking more like dragoons than halberdiers. Not satisfied with this we built a cannon. After we had our fling and grown up a little we disposed of the heavy equipment and became a respectable force of pikemen. On our way through this transition we found we had made quite a reputation for ourselves, regiments from opposing teams were visibly noticed on the battlefield to move in a crab like fashion to get in line for a friendly tussle with us, as a fighting force, lighter now and more mobile, we had arrived. It was about this time that we decided to try to become more authentic for Hintons Greycoats were not modelled on a true 17th Century civil war regiment. We started to look into the history of Newbury for that time and the activities of Lt Colonel John Boys. Boys we found we found was the garrison commander at Donnington castle so we ‘adopted’ him unofficially, and changed our name to Colonel Sir John Boys Companie of Hintons Greycoats. At the same time we changed our sleeves to white, setting ourselves out from the rest of the regiment which was not received in favourable eyes by Marcus Hinton, but we had made a move toward authenticity. Rebellion set in when we had a directive from the afore said officer, in as much as we must do away with our white sleeves and return to the greycoats to maintain conformity. This we did for about 4 months, but after our stupendous rendition of the second battle of Newbury (1971) we were granted regimental status by Captain General Brigadier Peter Young. We then became Col., Sir John Boys Companie of the Earl Rivers Regiment and fully respectable and authentic in name. The next problem we faced us was colours. We researched John Boys and Earl Rivers to come up with a uniform based on what we considered to be the true colours. Earl Rivers colours were rather difficult to trace but we did establish his standard was white with a red cross of St.George in the left hand top corner. John Boys’ family crest more readily available, being a black griffon rampant, on a gold ground with a red border surrounding the shield. The shield was surmounted by a variety of heraldic bric a brac including a helm. Lion etc. The uniform therefore, that we selected were based on a mixture of these details, cunning, and a little poetic licence. Boys’ standard was adopted intact and although we should by rights march under Rivers’ standard, we found him only to be commander in name only and as such did not deserve our support, besides Boys’ standard was more attractive! The white sleeves with black slash and black trousers are collusion of the black of the griffon and the gold of the ground which is correctly transformed to white, as heraldry white and gold are equal. The white of Earl Rivers standards ground had also been taken care of. The boots and helmets were chosen for protection. The lobster pot was chosen because it is far more protective than the morian and can be strapped firmly to ones skull and has every chance of staying there throughout each scrum, saving both head and neck from the inevitable blows, the guard diverting pike and sword points. Lobsters were worn by pikemen during the period, although the morion was more generally worn by both sides, and lobsters worn by cavalry. Many people wrongly think that morions were by Royalists and lobsters by people of the Parliamentary bent. Armour was so short at the time it was necessary to buy or steal wherever possible. The long boots are much better than shoes and stockings when charging like mad things through swamp, nettles and cow pats. A silver stripe with a red line through it is worn down the outside of each trouser leg denoting Royalist persuasion as does the sash of red worn about the waist. It was decided at the time that the pikes would have a red binding at grip height (a point that might well be revised). The buff coats worn as then and now are to authentic style and very orbust and warn and replaced the armour. Since the formation of the new Regiment in 1973 we have had some very traumatic experiences but also many triumphs. 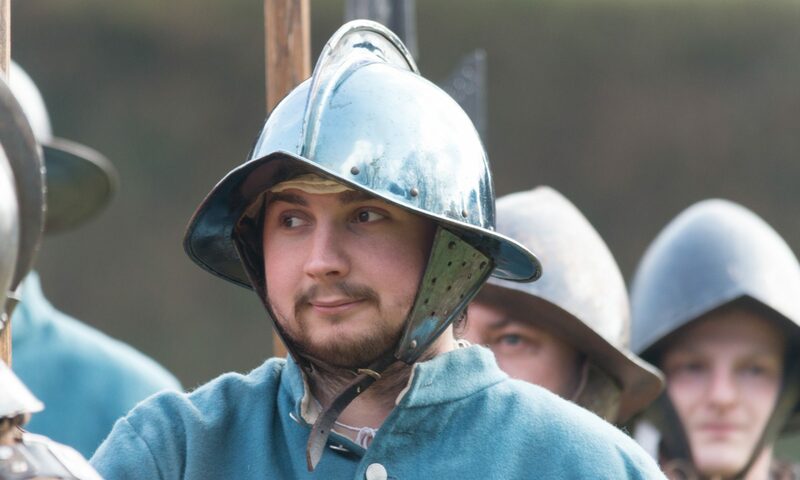 We have successfully put on profitable musters at Penton Mewsey, Tisbury, Newbury and High Wycombe possible making more money for the Sealed Knot than any other Regiment. The Regiment has won awards at Crayke Castle, Warwick, Ludlow, Penton Mewsey and Newbury, not to mention numerous personal awards. Sadly most of these honours gained in the too distant past when the regiment and its members were seldom out of dispatches. Although we have always been a regiment small in size and have had to take a hell of a lot of stick, we have a good reputation throughout the Sealed Knot, as a tough opponent. . . .
With this issue of A-TE-PRO-TE we herald yet another era in the history of Earl Rivers Regiment. We have had more than our share of problems in the past almost entirely, I’m sorry to say, due to lack of loyalty. We have also hit the heights, ‘small but great’. This has to be our last chance.!!!! Members join the Sealed Knot for many reasons. Whatever the reason one joins this society, which is an eccentric hobby, however you look at it, they do so at their own choice and get from it no more than they put in. Which means the spirit of the society must be fully adopted no matter how much it goes against the grain. The ideal members join because they are keen on the period, and all the society stands for, anxious to please their fee paying audience, and raise money for charity. He also becomes devoted to the regiment which joins. Unfortunately these saints are hard to find, but they do exist, let’s hope that we have a few among us to point us in the right direction. If we don’t start as we intend to go on I’m afraid the regiment will fail and disappear into obscurity forever. Should this happen there will be a rumbling and a roaring from the aisle of the north chancel of the Parish Church in Goodnestone-next-Wingham Kent, as our ancient hero shows his disapproval. Like as not such vibrations will throughout all England be felt, Heaven help any who provokes the wrath of big John who while a mere mortal killed a man with a punch. What ills could he perform as an incorporeal being? I shudder to think!!! A member of the Sealed Knot is in full view of the public from the moment he dons his ‘FUNNY GEAR’. As it is a hobby, for which the member pays his or hers own way discipline is difficult to maintain. This is where the loyalty comes to fore. Any member must be prepared to obey, immediately, and without question, any order or command given by an officer. There is always time to argue about any point at our democratic meeting. On the battlefield or parade we are actors in full view of the public. To act our pageants we must be authentic and know our drill backwards, THIS TAKES PRACTISE and don’t think the dumb public won’t notice. They will! When in July 1644 John Middleton, whom was holding Boys under siege, sent a letter demanding Boys to surrender Donnington Castle Boys replied thus…. ‘Sir I am instructed by his Majesty’s express commands and have not yet learned to obey any other that my Sovereign. This dogmatic loyalty must be followed by every member of our unit. ‘Fortis ad Bello’ was adopted in 1975 as John Boys Companie motto and means ‘Stronge in Battle’. We have always kept this side up, but have been greatly failing in discipline. Let us in reincarnation show the predecessors our sincerity and take up the age old motto of King Charles’ Soldiers ‘Love Loyalty’ added to ‘Fortis ad Bello’ and we will be without equal. It’s up to all of us!! !